Removing debris from blind or deep holes is an important yet risky task Nozzles have typically been used to blow into deep holes splashing out waste and making a mess in automated systems, and where manual effort is used, it makes for a messy and dangerous operation requiring protective gear to avoid injury. The Blind Hole Cleaning system was developed for the purpose of improving safety and minimizing or eliminating a mess. Some systems have appeared where a nozzle blows into a deep hole and a vacuum then draws the material removed to be taken away. However that does not work very well because you fight the blowing action with the vacuum action. This new system uses only a powerful blowing action and uses a venturi effect to draw out dust and debris from deep holes in drilled parts that are hard to clean safely. It is designed so that the hole is completely covered to address safety issues while compressed air is blown into the hole through specially designed nozzles. In this way, all the material in the deep, blind hole ends up in an attached, removable collection bag. No material is blown around the part or facility allowing for a cleaner, and safer, cleaning operation. The Blind Hole Cleaning System consists of three specially made parts: the Gun assembly, an adaptor for the appropriate diameter of the hole to be cleaned, and the nozzle for the particular depth range of hole. 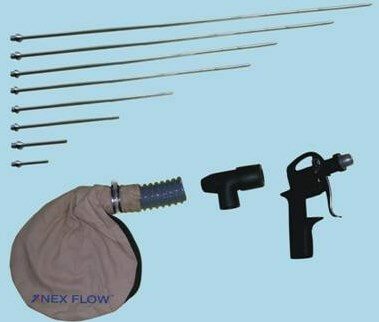 The Cleaning Kit includes all the hole diameter adaptors, all nozzles as well as a water removal filter with auto drain. 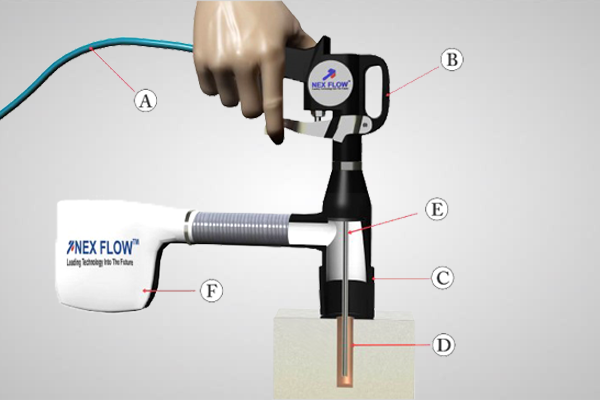 Instead of using the gun in manual cleaning operations, these systems can be adapted to automated applications that can supply the air as required to the hole adaptor chosen. Special designs can be developed for your application.